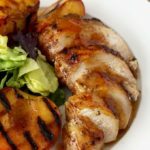 This Sticky Chicken with Peach Glaze and Grilled Peaches is sweet and spicy, so easy to make and beyond finger licking good! 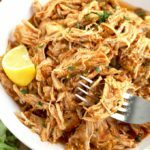 This Sticky Chicken recipe is the perfect summer dish to serve at your next gathering, backyard BBQ or potluck. 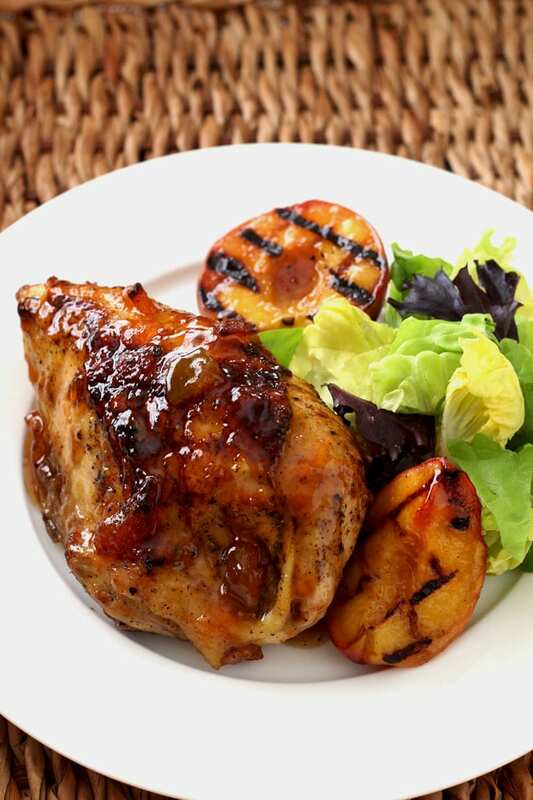 This grilled chicken breast recipe is absolutely delicious, a perfect balance of sweet (but not over the top sweet) and savory with a little bit of heat (or a lot if you choose to), a bit charred but not smoky, tender, juicy and the peaches….oh the peaches!! Grilled to perfection! 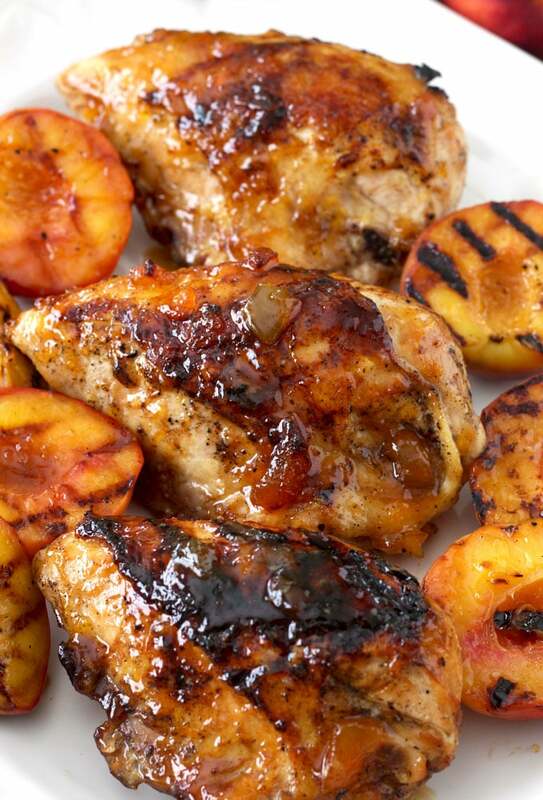 This Sticky Chicken with Peach Glaze and Grilled Peaches is absolutely amazing! 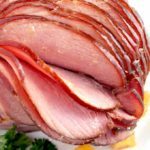 Even though I love grilling and I do it often (ask the hubs – we always laugh at the fact that I think I need to get a new grill every summer – not my fault Home Depot puts out such a wonderful grill display during the summer months). I used to stay away from grilling recipes with sweet sauces. The high sugar content in that type of sauce, meant super charred crusty chicken that was raw in the inside…. and black on the outside. All that stopped when I started grilling my chicken at home the same way we do it at restaurants. 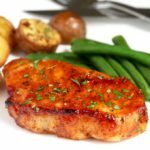 When cooking bone-in chicken breast with sweet glazes or sauces, is best to start the cooking on the grill and finish the cooking in the oven. 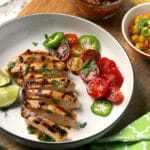 Using both the grill and the oven, guarantees perfectly cooked, tender and juicy chicken. Your chicken will have the beautiful grill marks, the perfectly charred taste from the grill but will still be juicy. The Peach Glaze only has 6 ingredients and it’s super easy to make. I usually have to keep my kids from drinking it with a spoon! Yes, it is that good! You can adjust the heat of the peach glaze to your liking. 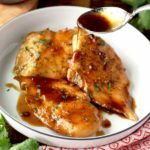 For this Sticky Chicken recipe, I used bone in and skin on chicken breast but you can use boneless and skinless chicken breast also (just adjust cooking times as boneless chicken will cook faster). Brush the chicken with olive oil and season it with salt and pepper. Place the chicken, skin side down on the grill. Grill the chicken for about 6 – 8 minutes. Flip the chicken and glaze the top (the part with the skin on). Cook for about 5 – 6 minutes, flip the breast and at the glaze to the other side. 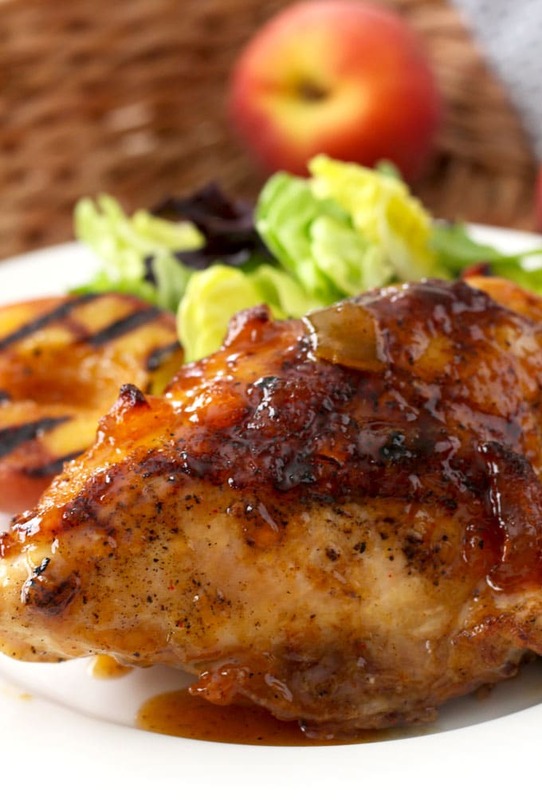 After a couple of minutes, remove the chicken from the grill and place it in an oven safe dish. Add more glaze to the top and finish the cooking in a pre-heated 350 degree oven for 30-40 minutes or until cooked through. The internal temperature should reach 165 degrees. Voila! 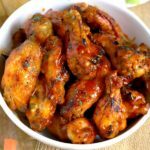 Sticky, golden, perfectly grill marked, moist and delicious chicken! Grilling peaches is super easy. Place the peach halves on the grill cut side down, grill for 2 minutes. Turn and brush with the reserved glaze. Grill until the peaches are soft (about 3 more minutes). I do not peel the peaches before grilling them. In a pinch, orange marmalade also works well in this recipe. Different flavor profile but still delicious! 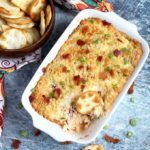 There, now you have 2 totally different recipes. You are welcome! 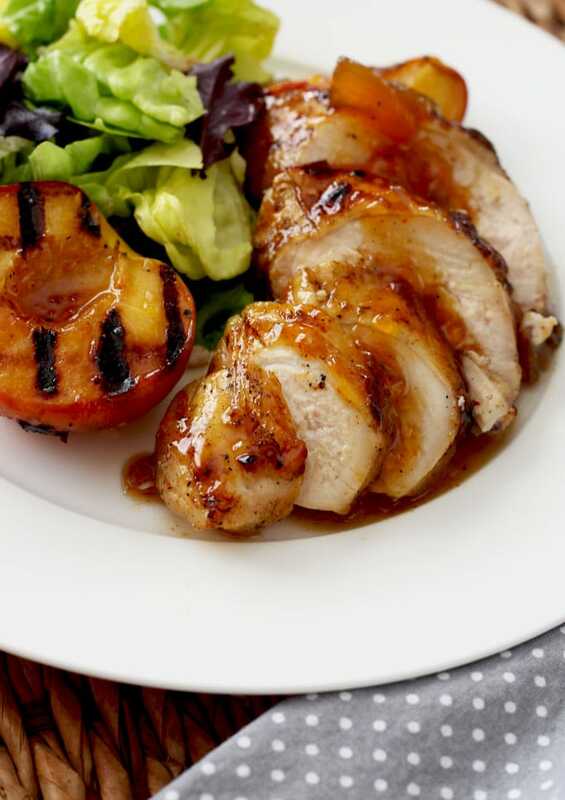 WANT TO TRY THIS STICKY CHICKEN WITH PEACH GLAZE? PIN IT TO YOUR CHICKEN OR BBQ BOARD!! For the glaze, in a medium bowl, combine the peach preserves, garlic, olive oil, soy sauce, Dijon mustard, cayenne pepper, salt and black pepper and mix well. Reserve 2 tablespoons of the glaze. Brush the chicken with olive oil and season with salt and pepper to taste. Place the chicken on the grill skin side down and cook for 6-8 minutes or until golden brown. Turn the chicken over and brush some glaze on top. Cook for another 5-6 minutes. Flip the chicken, brush with the glaze and cook for an additional 2 - 3 minutes. 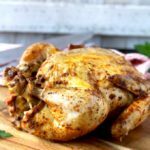 Remove the chicken from the grill and place it in an oven safe dish. Generously brush more glaze onto the chicken. Place in the oven and cook for about 30-40 minutes or until cooked through. Place the peach halves on the grill cut side down, grill for 2 minutes. Turn and brush with the reserved glaze. Grill until the peaches are soft (about 3 more minutes). 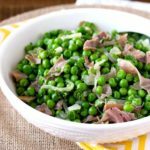 Love your recipes AND your commentary! A chef with a sense of humor adds cheer to menu planning. I made this tonight. It was so easy and so good. I’ll definitely make this again and again. 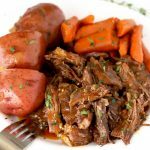 This recipe has become a regular at our home.That glaze is amazing and you can adjust the heat which is great. Turns out perfect every time. Thank you!! Glad to hear!!! This looks so delicious! I almost never cook chicken because I always overcook it but yours look so tender and juicy! And the grilled peaches are a super fun touch, I absolutely love grilled fruits 🙂 Thanks for sharing! Can you substitute fresh peaches for the peach preserves? Hi Erin, not sure what you mean. You can absolutely make your own peach preserve with fresh peaches and use that for the glaze. Hope that answers your question. Thanks! Thanks for sharing! 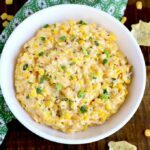 I love how simple and easy this is! So many sides will go well with it too!